Dialogue Incorporated: Live Review: M. Ward | Rave On! 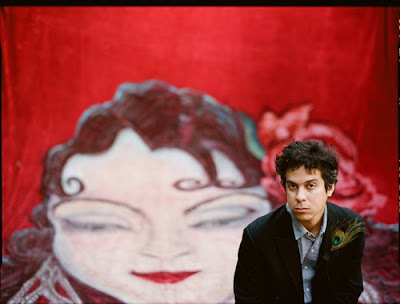 There’s little doubt that M. Ward’s clever partnership with indie film starlet Zooey Deschanel, as She & Him, has garnered him a broader fan base. I, for one, have to admit I may have never discovered him if not for this choice of attractive young frontwoman. But M. Ward is so damn talented—his fingers blur across the fretboard—it’s impossible for him to remain in the shadows for long. Touring on the back of his latest album, Hold Time, Ward stepped back into the spotlight last night at the Vic Theater with an unassuming projection of a cabin’s window as the only backdrop. As the scenery on the other side of the window slowly turned from dusk to dawn, Ward took the sold-out crowd through all the best moments from the new album and a few key numbers from past albums, mostly from Post-War. Right from the get-go, onlookers got a true glimpse of his prowess when the band stepped aside and he let his opening guitar solo fly like some modern-day Johnny B. Goode or Wade Walker, Johnny Depp’s character in Cry Baby. Later, while the backdrop faded to a starry night sky, Ward eased the pacing with a few solo songs, paring back to only harmonica and guitar. At points, as on “For Beginners,” he was strumming out more sound on his lone acoustic guitar than he was with his whole band behind him. But before long the band was back on stage riling up the crowd one last time, in true rockabilly, floorboard-bouncing rhythm ‘n’ blues fashion, honky-tonking its way through a finale and, count ‘em, two encores.